When someone describes a pitcher that can throw hard you are more likely to hear “he’s got a strong arm” then you would “he must have a huge vert” or “he must be able to squat a ton”. Since the ball is released from the hand which is linked more closely to the upper body than the lower body the former of the two gets all the glory when attributing the force needed to be produced to throw 90+mph. Pitching is the sequential activation of body parts through a link segment beginning with the contralateral foot and progressing through the trunk to the rapidly accelerating upper extremity.” Pappas et al. (1985). I highlighted that specific part to stress that the power produced to throw must start from the ground and the rest of this post will go into detail about the specifics and what the research says. The back leg (the same side leg as the throwing arm) generates the linear velocity that initiates the ball being thrown towards homeplate. This same back leg has also generated some controversy in the pitching world in regards to how exactly this force should be generated. lower body is needed to research the highest levels of each respective sport. performed exclusively in the front plane – medial to lateral. It makes sense that the more powerful one can triple extend in this manner the more energy one could potentially convert into ball velocity. I know that if I was allowed to I would pitch more like a cricket bowler to produce some serious linear velocity in the frontal plane. There are two respective schools of thought when it comes to pitching. There’s the “drop and drive” camp versus the “Tall and Fall” with less emphasis on driving towards the target. One research paper in particular looks at this issue and digs deep into how much force the lower body is producing. 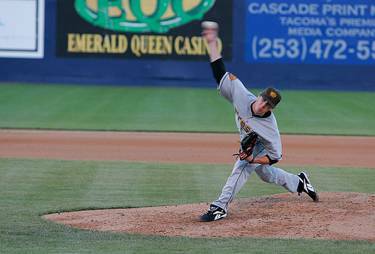 The Study: Characteristic Ground-Reaction Forces in Baseball Pitching. 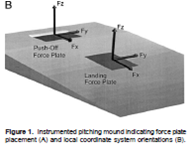 The goal of this paper was to look at the ground reaction force patterns of the individual limbs and investigate the significance of these forces in pitching mechanics. One previous study by Elliott et al. (1988) has been performed however it only used one force plate and one single camera to record all data. with forces equaling -0.35 BW (body weight). This value is negative because the forces of the back leg are being applied in the opposite direction of the ball causing the body to go forward. Does pushing harder equal more velocity? The higher the forces generated towards the target did in fact translate to higher linear wrist velocities (r2=0.82). The reason that the study relates this information to wrist velocity rather than ball velocity is that the authors did not gather ball velocity with each subject. They did however test throwing velocity with one of the subjects to determine if wrist velocity correlated to ball velocity which it did (r2 = 0.97, N =5 trials). Most of us would assume that a faster wrist would produce more velocity than a slow wrist. Fast wrist = Fast Ball = DUH!!! The authors hypothesized based on their findings that the greater the force created in the direction of the pitch the faster the velocity because of the fact that there is more kinetic energy which could potentially be transferred to the upper body and ultimately the ball. 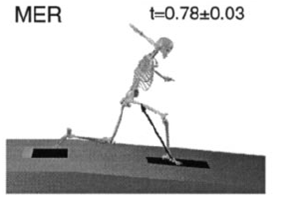 In the discussion of this paper the authors stressed the need for generating forward momentum with the back leg and even stated that the pitchers in this study who developed the highest forces relative to their body weight threw the fastest. With this information the authors said that the data they collected contradicts the theory of the “tall and fall”. A study by Fleisig et al. (1999) confirms this theory. His study demonstrated that members of the “high” velocity group had increased pelvic velocities compared to the high school ad youth pitchers. 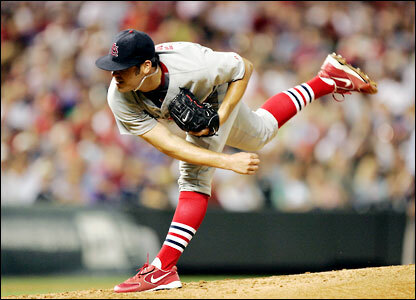 The front leg that the pitcher lands on (opposite side to their throwing arm) plays a critical role in being able to harness and transfer the energy produced by the back leg. The MacWilliams study stated that higher push off forces created more wrist velocity but this did not happen each time, although the correlation (r2=0.82) is high it is not 100%. The authors stated that some of the subjects exhibited the opposite trend in that the harder they pushed the slower the ball went. This is what is known as over pushing or over throwing in the baseball world. This can be related to the fact that you have to be strong enough with the lead leg to absorb all of the energy that the back produces not to mention the fact that you are going downhill with the mound. This brings us back to the Pappas quote at the beginning of this post that mentioned how the link segment responsible for energy transfer starts with the contralateral foot. This lead leg must capture this energy and transfer it superiorly. The more efficiently one can do this the harder they will throw. shoulder. Vertical forces that are equvilant of 1.5 BW were recorded as energy transferred from the ground up the chain. The lead leg also exhibited braking forces of the front leg with an anterior shear of 0.72 BW. 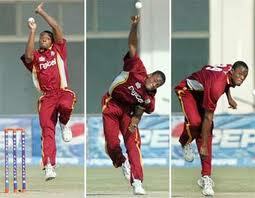 The higher forces that were generated by the lead leg indicate its vital importance to a successful throw. In a 2001 study Matsuo et al. (two of those et al. people were Glenn Fleisig and James Andrews who are two of the bigger names in this field) found that one of the differences between slow and fast throwers (N=147) was what happened with the lead leg. This paper deserves its own blog post which will happen soon enough but for now all you need to know is that members of the fast throwing group exhibited less knee flexion and many even produced knee extension between the time that the lead foot made contact with the ground to the time the ball was released. 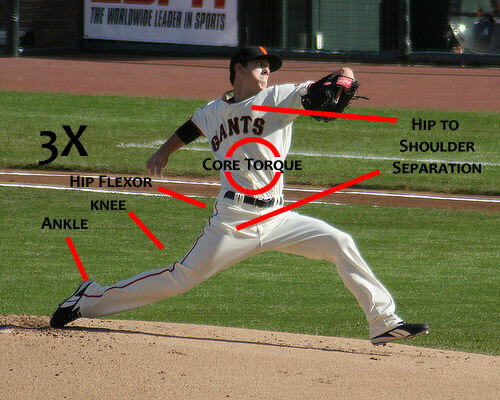 Members of the slow throwing group more often than not demonstrated knee flexion. 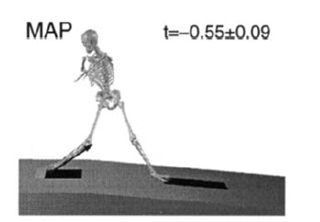 The researchers described the role of the lead leg by stating that “the landing leg serves as an anchor in transforming the forward and vertical momentum into rotational components; posteriorly directed forces at the landing foot reflects an overall balance of the inertial forces of the body moving forward to create ball velocities. 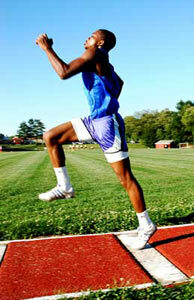 Both legs are vitally important in order to produce and redirect the necessary force. 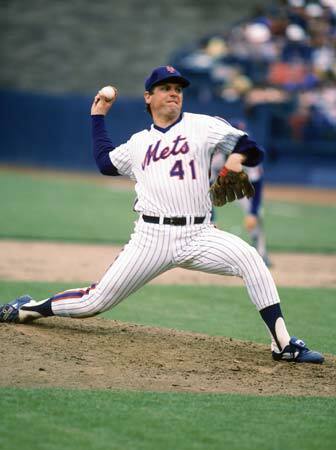 In my humble opinion we should place a strong emphasis on the deceleration component of the pitching mechanics with the use of some eccentric single leg work. When pitchers try to muscle up and push off harder than they are capable of absorbing there will be an energy leak somewhere along the kinetic chain resulting in decreased throwing velocity. Just like with income it’s not how much you make it’s how much you keep. stabilize the load not to mention the fact that the rotator cuff must reflexively stabilize the humeral head in the glenoid fossa but we will be able to get into this in future posts. 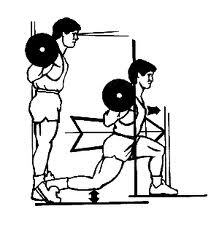 In the mean time work that lower body with some serious resistance because it must be able to handle some serious ground reaction forces. If anything the baseball player should train the opposite of your average meat head who trains 80% or more on the upper body and less than 20% on the lower half.